Again more than 40 local area amateurs attended what is becoming to be a popular Christmas tradition. A great hot & cold buffet lunch was served up by the Ultimate Appetite - a new restaurant located at 1595 Victoria St. N. in Kitchener. The new site proved a good choice not only for the fine food but its convenient location with good parking was also a bonus. Paul, VE3BBB took time out from is active retirement to join the gang as did Paul, VE3SY and the XYL Margeret, VE3BLJ. We were all happy to see Dex, W2VCI with his XYL as well - a long drive but Dex said well worth it for the food and fellowship. Also good to see Harold, VE3DWH (another retiree) Roy, VE3RDF (is everyone retired?) Well no but still there was Drew, VE3AOR and his XYL Mary VE3MWE and Bill, VE3IAP (whew). Among the working stiffs who could find the time to come out were Gerry, DYY and his dad VA3ERF (once WD4NBG and also retired), Zenny, VA3ZEN also from Roger's, and speaking of Roger's - Roger, VE3RKS plus John, VE3DOS; John, VE3AMZ; Terry, VE3NEJ; Gord, VE3NQY recovering nicely from recent surgery - sure didn't curb his appetite eh! Paul, VE3CHM; Bill, VE3WLL - and of course others whose call did'nt get noted (with our apologies). 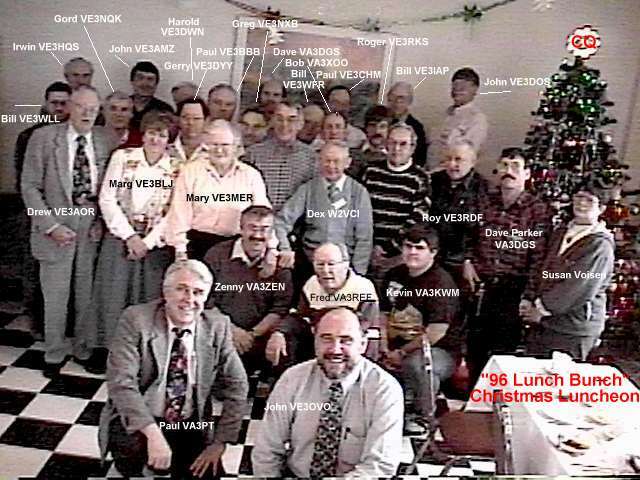 The Lunch Bunch, for those interested in things historical, began many years ago - Techy's and Sales types whose job had them out on the road during the day would often call in on VE3KSR looking for some lunch company. Before long lunch gatherings reached sizable numbers, with every day having a different count and some different faces. Although not a formal club or organization this gathering began to be called 'the Lunch Bunch'. We'd also be remiss to mention the help we often received from 'Cookie', VE3DTB. Many a day, as he motored back home to Cambridge at the noon hour, he would hear the odd ham check in after 12:00 noon. He'd jump in to tell us that the gang was at such'n such a restaurant and point the latecomer in the right direction. At the suggestion of John, VE3OVO some eight and a bit years ago - why don't we organise a Christmas Lunch? I for one thought it was an excellent idea - and when John asked for a volunteer to help out I guess I forgot to take one step back like all the other troops did! I hope that everyone who attended enjoyed themselves - and we'll look for your company at attend next years gathering. We also hope your Christmas and Holiday Season was a Happy One!